Pixel Scroll 11/5/17 I’m The Pixel Of Scrolls. What Were You The Pixel Of Again? (1) RANTS AND RAVES. Three days ago S.T. Joshi ranted about an alleged Lovecraft hater in “The Multifarious Illiteracies of Brian Keene”. For the past two or three weeks I have been in misery. 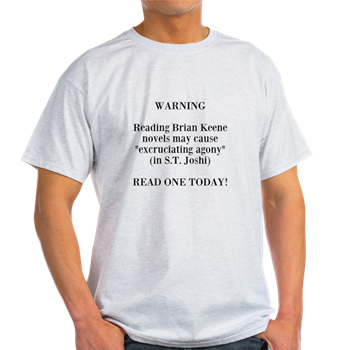 In short, I have been reading the novels of Brian Keene. Were I not driven by my sacred duty as a literary critic to assess the work of this grotesquely prolific blowhard for my treatise, 21st-Century Horror, I would have been relieved of this excruciating agony; but the job is done, as is my chapter on Keene, which can be found here. …The only horror in Keene’s work is that there is so much of it. Since 2000, Keene has published at least forty-three novels, twelve short story collections, and sundry other material—an impressive achievement if his books were of any substance or even bare competence, but quite otherwise if, as appears to be the case, the books in question are nothing but crude and slapdash hackwork. A fair number of his books have been published by Leisure Books, a firm that habitually churns out pablum of all sorts for the great unwashed. It seems to be a match made in hell…. Today Brian Keene answered with “The Ballad of S.T. Joshi, or, Saruman and Wormtongue Meet the Great Unwashed”. …With that being said, the probable origins of Lovecraft’s work are, in my opinion, repugnant. Lovecraft was racist and xenophobic…. These beliefs fueled his fiction, and the creation of his mythos. So much of Lovecraft’s work is driven by fear and disgust of “the other” or of genetic mutation. And in turn, so much of that work shaped and molded this field. Despite their repugnance (or perhaps because of it) I think those origins are worth discussing. Joshi does not. He threatened to boycott a recent convention because the programming included a panel discussing the racist themes prevalent in Lovecraft’s work (and then reportedly defied his own personal boycott by signing books in the dealer’s room of that same convention). Because I wondered aloud on my podcast why he’s against discussion of such things, it further inured me as a “Lovecraft Hater”. Joshi also railed against the World Fantasy Awards discontinuing their bust of Lovecraft. When I stated on my podcast, “If I was a person of color, and I won that award — an award from my peers recognizing my work — I wouldn’t want a man who thought I was sub-human glowering down at me from my brag shelf”, this further fueled Joshi and Brock’s insistence that I am, in fact, a Lovecraft Hater. So, again, for the record, I am not a “Lovecraft Hater”. I respect the man’s work. I don’t, however, respect the man. …Which brings us to last Friday, and the reason why so many of you are asking me, “Who is S.T. Joshi?”. Why did Joshi turn his attention toward me? I don’t know. Maybe it was our coverage of his antics on my podcast (where he is a recurring source of amusement). Perhaps he was offended that I sandwiched him between “Lovecraft Haters” Ellen Datlow and S.j. Bagley in the inaugural chapter of History of Horror Fiction. Or maybe he was driven half-mad by Jason Brock’s incessant whining. Regardless, I woke up at 5am Friday morning. Publisher and author Ross Lockhart had sent me the link to Joshi’s tirade overnight. I clicked the link and read Joshi’s Introduction, where he states that I am “A grotesquely prolific blowhard” and that my work left him in “excruciating agony.” This pleased me. I thought it was funny enough to craft a cover blurb out of, so I did. Then some readers asked for it on a t-shirt, so I made this. And that was pretty much it…. (2) AMBIFORCESTROUS. Continuing a thought from yesterday – this comes from Mark Hamill himself. "I've looked at life from both sides now From light & dark & still somehow It's life's illusions I recall I really don't know life…at all"
My short-short summary: Way loads of fun! Go and enjoy. Among the best snappy multi-character dialog, and lots of it. Basically sticks to one plot from start to finish (unlike, say, Guardians of the Galaxy II). Nice to NOT see Manhattan/NYC trashed/destroyed/etc for a change. Similarly, no S.H.I.E.L.D. helicarriers harmed (or even sighted) in this movie. Lots of bright colors, great costumes/garb/accessories. a good balance of talking, fighting/battling, and both-at-once. It’s contemporary fantasy and sci-fi. Thor pilots spaceships, etc. prior knowledge needed of Marvel, any of the previous movies, etc. Yeah, knowing some can’t hurt. E.g., Loki and Thor briefly mentioning the time L turned T into a frog was real — one of Walt Simonson’s great arcs (a bunch of issues) in the Thor comic series. In terms of “Marvel movie big picture,” this is sequentially following the events of Avengers/Age of Ultron. Best Stan Lee cameo to date, IMHO. Mentions Avengers by name at times, etc., but only Hulk actually in the movie. Most of the action is off-Earth, so no need to explain why the other A’s aren’t putting in their oar, so to speak. Lots of Jeff Goldblum! Lots! Offhand I don’t have any complaints or criticisms. (4) REVIVAL MEETING, And everything considered, this seems a good time to ponder “The Norse gods’ unlikely comeback” as Mark Peters does in the Boston Globe. (5) HUBBARD. Alec Nevala-Lee, “author of Astounding, a forthcoming book on the history of science fiction, digs into the writing career of L. Ron Hubbard, gaining new insights into the life of the controversial founder of dianetics and the origins and nature of Scientology itself” in “Xenu’s Paradox: The Fiction of L. Ron Hubbard and the Making of Scientology” at Longreads. And it gets even stranger. When we turn to the stories themselves, we find that most of them have nothing in common with the tale of Xenu. In the pages of Astounding, Hubbard tended to write comic fantasies or adventures staged on a very modest scale, with situations lifted straight from the nautical or military fiction that he was publishing elsewhere. Aliens and galactic empires rarely played any significant role. When he employed these conventions, it was as a target for parody or as a kind of painted backdrop for the action. Yet when the time came to give Scientology a founding myth, he turned to space opera, referring to it explicitly in those terms, and the result didn’t look or sound much like anything he had ever written before. RE that last RT: I (and most other writers I know) am deliriously happy to sign things if you run into me (or find me) on a convention floor or hallway, or a bookshop. Or send me a snailmail! Do not hunt down my hotel room number and call me in the middle of the night. SERIOUSLY. (7) PROBLEM WITH COMPLAINT-DRIVEN CON POLICIES. A New Mexico event promoter says complaints led him to change a policy — “Comic Con ditches free passes for military, first responders”. How well do you think that worked? An offer for local military and first responders to enjoy the Albuquerque and Santa Fe Comic Cons for free is about to end. The promoter, Jim Burleson, said he was getting threats for giving free admission to only military, police and firemen. The decision stems from people — other than military and first responders — who complained about not getting a discount over the years, which, he says, led to threats. “We actually got threatened at our Santa Fe Comic Con. Somebody threatened to call their dad who was a lawyer to prove that we were discriminating,” he said. Now, there’s even more backlash from people who said he shouldn’t have given into the criticism, with some claiming they won’t be attending comic con anymore. Mike Kennedy found a scientific breakthrough in Monty. John King Tarpinian passes on the Star Wars nutritional advice he found in Brevity. (9) LEAF BY TOLKIEN. Glen Dixon of the Washington Post Magazine writes about the death of the Baltimore City Paper which just folded, in “Baltimore City Paper is closing after 40 years. Will it be missed?” The following scene is inside the City Paper’s offices…. The wisdom of the crowd converged when Brandon Soderberg puzzled over the mysterious provenance of Gray Haven, the latest strain of marijuana to cross his palate. Soderberg is both the paper’s editor and one of its pot critics. He knows his weed, but he hadn’t been able to uncover the first thing about this particular variety. Perhaps the name held a clue? He read off some loopy texts from a helpful stoner friend, a Tolkien fan who said there is a place called Grey Havens in Middle-earth. The messages were pipe dreams billowing with head-spinning arcana. “I’ve read ‘The Lord of the Rings,’ ” said art director Athena Towery, dryly. “I don’t think that’s in there.” The room erupted with laughter, then settled on another Tolkien work — “The Silmarillion” — as the source. Photo editor J.M. “Joe” Giordano added that the bud shares its name with a neighborhood in Dundalk, Md. (12) CREDENTIAL RENEWED. Kim Huett advises his article “Temple of the Sphinx”, with some thoughts on the William F. Temple story, “The Smile Of the Sphinx,” is now online. In a fit of possibly misplaced enthusiasm I have created a website in order to post my Bill Temple article online for all the world to see. Those of you already familiar with this article might like to note that it has been rewritten here and there in order to fix a few errors and to add a little more depth to the story. In regards to the latter I would like to in particular thank Rob Hansen for all his hard work on THEN as that history made my job so much easier. The website in question can be found here at the URL below. Feel free to pass the URL on if you want as I think this is a story well worth sharing. This is especially true since it allows us to increase our count of times the word “cat” has appeared on this blog. Now at first glance all this makes very little sense as The Smile of the Sphinx is a rather absurd tale about an intelligent race of cats from the Moon who secretly rule the Earth. (13) CHOCOLATE EMERGENCY. Adweek shares the laughs — “Snickers Got a Whole TV Channel to Act Weird When It Was Hungry in Great Media Stunt”. The network is called Dave, and it normally features a millennial-focused grab bag of fun-loving programs. But one day recently, at exactly 3:28 p.m. (which Snickers says is “the hungriest time of day”), Dave suddenly and inexplicably turned into Rupert—a network showing boring and nonsensical shows including chess championships, vintage film noir and an art appraisal program. Frankly, it seemed like Dave had become PBS. This entry was posted in Pixel Scroll and tagged Ann Leckie, Brian Keene, Daniel Dern, Fran Wilde, J.R.R. Tolkien, Joe Haldeman, John King Tarpinian, Kim Huett, L. Ron Hubbard, Lovecraft, Mark Hamill, Mike Kennedy, N. K. Jemisin, S. T. Joshi, Star Trek, Star Wars, Star Wars: The Last Jedi, The Avengers, Thor, William F. Temple by Mike Glyer. Bookmark the permalink. This is a joke, right? Leftists love to criticize each other. Only with respect to how long each applauds….. Working back towards SFnal oriented criticism, my primary issue with N.K. Jemisin’s works has been the occasional leftism that blows holes in her plots. A couple examples. *** In Obelisk Gate, it seems that society forgoes market exchanges during a “season”. The idea being that a central government is better at allocating scarce resources. The reality is that some form of market exchange always provides for a more efficient allocation of scarce resources as individuals are better at determining how important that resource is for their individual livelihood. *** In The Hundred Thousand Kingdoms, a great deal of effort is put into making the emperor and his family out to be despotic and oppressive. it is pretty patently a criticism of white colonialism towards brown peoples. Yet within the context of the book, he forces the various kingdoms to not wage war on one another and to instead resolve their conflicts via negotiation and trade that ends up fostering wealth for everyone. He prevents kingdoms from stealing children from their neighboring kingdoms for use/abuse/murder in bloody rites of passage. How horrible of the emperor to foster negotiation and trade while opposing war, kidnapping, and murder. *** A lot of the superhero literature out there focuses on presenting the hero/mutant as being equally motivated to be a productive member of society with examples of how the hero/mutant’s abilities are an asset to everyone else. Essentially, the individual’s differences are assets to society. But back in The Broken Earth world, the worst fears about the orogenes are realized to be valid concerns. Which raises the dark spectre that perhaps society did need to control them. Not exactly the preferred outcome from leftist identity politics. Keep in mind that I put Obelisk Gate in the second position on my Hugo ballot this year. It was a very close decision. I don’t dislike her work. I just think it would be even better if she jettisoned the leftist/collectivist worldview and focused more on the liberation of the individual. The reality is that some form of market exchange always provides for a more efficient allocation of scarce resources as individuals are better at determining how important that resource is for their individual livelihood. During the late unpleasantness the UK was pretty much short of everything. And what there was, was distributed unevenly. The chosen solution was rationing and it worked well. Not only was there fairer distribution, but general health was better. Tooth decay dropped, pregnant women had vitamins and neo-natal mortality improved. This is the most right wing source I can find but there are many others. I am always quite amused by the British penchant for understatement. I have heard “the late unpleasantness” in the South as a reference to the American Civil War. And yet a cursory read at that link indicates that market forces were still in play. Was the food given out for free? Or were there ration books that simply limited the amount a person could purchase? Were people free to grow their own food to supplement their ration books? Most of the rationing systems I’ve seen still use some sort of market forces. With respect to The Broken Earth, I could buy…pun intended…some sort of heavily regulated market where people are encouraged to use initiative to solve their own problems. But simply decreeing that people cannot trade goods creates an uncontrolled black market that is usually quite exploitive while simultaneously ensuring that goods are not distributed where they are needed most. @Cora: Discounts for various things are common in the U.S., too, for minors, students, and people over a certain age (but usually not the other categories you mentioned). Though the people who complained about the free entry for police officers, firefighters and military personnel were just jerks. I’ll never understand why some people get angry when someone else gets a perk they don’t qualify for. Agreed! Cultural differences in who gets discounts for what are just that – cultural differences – but a jerk is a jerk in any culture. (6) ONE TOKE OVER THE LINE. OMG the mind boggles and the stupidity of whoever did that. Ah, the right wing version of Godwins Law. The one that comes upwhen someone is out of arguments and knows it. I love this endorsement of social democracy as part of the market economy. I had a good laugh when I clicked that link. I didn’t get that impression at all. Like August says, my impression was that the society had the cultural tradition during a Season to break up into small autonomous ‘comms’ or walled city communities in which each community subsisted on its stored food and goods, continuing whatever economic activities possible while imposing strict rationing of resources and martial law within its walls while opposing attacks from without, for the duration of the emergency. If a comm wasn’t prepared enough with resources to last, or means to trade for them, or capable of attacking another comm to get them, they were fucked. I certainly never got the impression that the comms depended on the central government to dole their food and resources out for them. And as far as I could tell from the Season we actually witnessed in the book, trade still went on (though in a much more cutthroat manner than usual) – people in the beginning still used money, comms traded with commless refugees for what goods they had, there were references to prices going up, and the implication that it would get very much worse very fast, and that this was standard for a Season. Location 1541 in my Kindle version of the book. Like I said, some sort of regulation or rationing system makes a certain amount of sense. But a total ban on market economies is a recipe for starvation. As far as I can tell, that’s within the comm, which is run on very tight authoritarian lines – which makes sense when there is a known and finite amount of resources, and the likelihood of getting more through trade is unknown and likely minimal for a undetermined period of time that may be months – or years. The leaders of the comm have to make sure that resources are shared out within the walls fairly enough that the people within cohere to each other effectively for maintenance and defense under their leadership and do not rebel against them, and must keep a lid on conspicuous waste of resources, both so they can last and to keep the potential for rebellion within at a minimum. IMO, letting a laissez-faire market reign for food under those circumstances makes about as much sense as letting one reign on a Navy ship on a long-term mission in hostile territory during wartime to feed the sailors. I agree. That is within the comm. It makes no sense as the only reason for people to contribute is the brute force of their authoritarian leadership. Mass graves are made in this way. Credit to Ms. Jemisin in that she acknowledges some of the problems associated with banning markets. One of the auxiliary protagonists is an inventor. So their contributions are not immediately evident to those that are working to produce/grow food on a daily basis. Curiously, I have a bit of experience with ship board life during a conflict as well as some experience ashore. Trade exists even under those conditions. Although food wasn’t an issue as there was a lot of it. While I appreciate the book recommendation, I’m disinclined to read the imaginings of a young Marxist. I know he calls himself an “anarchist”. He could call himself Ulbrechta, Princess of the Khraelon Mountains and it wouldn’t change the underlying ideology that he’s peddling. Humanity has been engaging in trade to resolve material shortages/needs since the dawn of homo sapiens sapiens. This is so stupid and uneducated. Anarchy is not the same as Marxism. They do not share the same underlying ideology. Anarchists were against Marx even at the first Paris Commune. I’m sure trade exists on the ship, but survival of the sailors onboard does not usually depend on it. Which is why I made the ship in my analogy one on a wartime mission of uncertain length in hostile territory where going ‘ashore’ at will is not going to be an option and the supplies onboard will be all one can reliably depend on. How often does it happen in the Navy with the outbreak of war that the officers state they will cease to abide by the old contract of free food and medical care as a given, and demand that the men pay for it with the medium of exchange of their salaries – which will be likely subject to wild devaluation the longer the mission lasts and the less people believe they will live to use the money – or their services according to the greater or lesser demand for them at any time, or whatever they happened to have brought with them in their cabins as long as it lasts? Have you ever served in a mission like that? Do you have any historical example of one, to serve as proof of your assertion that this way is superior than the authoritarian overview of the food and water and other necessities of life on a confined military mission in dangerous territory? IMO, that would lead to mutiny in short order. The difference is, on the ship where you served, there IS always food to be had without concern and a place to go ‘ashore’ eventually. How do you expect ‘trade’ to magically resolve shortages/needs in a comm during a Season, when the shortage is of food and agriculture is canonically down for the duration? How do you expect ‘trade’ to conjure up food in territories where thousands of miles are devastated, roads and transport decimated, and no known endpoint to the crisis? Please be specific. The Navy is an example of an authoritarian structure. Is it therefore necessarily ‘brute force’? Martial law is declared on the onset of a Season. The inhabitants of the comm do give up a lot of freedom upon the declaration – but they do get a great deal in return. They get the kind of contract that the sailors of the naval ship gets with their superiors, one that is well understood among them all, a share in the town stores they have contributed to in the time of freedom and plenty and the aid of their neighbors to defend the walls to keep their stores safe, under the guidance of the leader they chose in peacetime. I can’t see how an ‘every man for himself and the devil take the hindmost’ organization of the scarce resources and the defense of them is superior on a ship in hostile territory or in a city under siege (to use another analogy). And if you wish to insist that it IS, please give a real life example, one that actually HAS a bearing on the distribution of a scarce and not easily renewable supply of the necessities of life under a free market in a confined space – which is not true of the ship you served on where the food was a given and ‘ashore’ was a thing that could reliably happen on a predictable basis. Vernor Vinge’s “A Deepness in the Sky” has a lot less free market anarchist screeching than some of his earlier works, but he still has this little spiel in there about how on just three ships stranded in an alien system, hiding and reliant on their own resources for years, the central planners, even with inhumanly good automation, can’t allocate resources as well as the Traders black market. Oh, I’m sure that even in the best run comm in the middle of a Season there WILL be a black market…Jemisin in fact is clear enough to show it happening, with the whole thing about the Innovator selling fans. She also shows that while Imperial law (and presumably stonelore) affords the leader and local government the legal tool to discipline the black marketer, it is flexible enough to leave the actual penalty to be imposed upon the violator up to the local government to decide…presumably so that the leader can have the option to be gentle when the infraction is minor, or even to ignore it – as in the case of the Innovator, when the supply situation is not yet desperate, so the fact that the Innovator is using it to sell luxuries (for what currency, one wonders?) isn’t such a big deal and the council is trying to decide whether to bother to punish at all. But the local government is clearly empowered to choose to use a heavy hand in the case of brutal price gouging in the sale of necessities, and though the case does not arise in the books, Jemisin paints the picture and the people involved clearly enough that one is sure they’d come down HARD in such a case. I think she thought hard about it, the way she drew the picture of the comms as walled towns, each with its cache of emergency supplies, with each family with its members with a designated role in the comm entitled to a share in the town cache – with ALSO each family maintaining its own cache in its own compound, and the potential to close the doors and defend the home with the members of their own family from hungry neighbors if the central food supply runs out. I think that shows she thought hard about it even though we never actually SEE the consequences of one besieged comm gradually running out of food over the course of a Season, and how the system works in its own grim extremity. IMO, I think the system she pictured is not just intended to work in the strict dollars and cents view of economy – it’s also supposed to work to promote social cohesion, the feeling that the community is a family and an army working together to survive and defend themselves against a hostile world of poisoned deadly environment and hostile neighbors. If some families have a better cache than others at the start, or if some homes are destroyed with some supplies ruined at the start of the cataclysm, it is canonically considered socially acceptable for a family to choose to either give help and resources to their neighbors beyond what the neighbors may be entitled to from the town stores, or to choose to withhold it for their own families’ sake. It is considered, however, wrong as well as illegal to demand payment…not to say it doesn’t happen (as Jemisin shows), and can be punished depending on the gravity of the situation. IMO, it’s not really that much different from our own disgust and rejection toward people profiteering in a disaster situation, and championing as heroes people who help others during a disaster without expecting payment – except in Jemisin’s world the disasters are frequent and worldwide. It’s supposed to promote a ‘we’re all in this together’ attitude, ready for the work and the hard sacrifices. And probably it’s supposed to prevent power struggles by people accumulating enough resources to challenge the leadership to get possession of the rest, leading to bloody fights that make the death toll even worse than it might be without them. While I appreciate the book recommendation, I’m disinclined to read the imaginings of a young Marxist. I know he calls himself an “anarchist”. The man is nearly sixty; I’d hardly call him young. * Additionally, Marxist and anarchist are not synonyms. Anarchism is often closer to libertarianism (depending on your flavour of anarchism) than it is to Marxist socialism; the big difference between anarchism and libertarianism is that anarchism hopes to free you from the necessity of selfishness, while libertarianism wants to free you from the necessity of everything but. *Edit: additionally, he’s an acknowledged expert in the field of anthropology, which is the primary subject of the book. The list of citations and references take up approximately a hundred pages. It’s hardly a book of “imaginings”; rather, it is a book of evidence. Pssst, remember that Dann only recognises two ideologies – his, and everything else – and he can’t tell the differences between anything in his “everything else” bucket.